For Joy her first agility-match into the Beginners-classe, nearly 18 months old. The week before, on the training, she was fall of the dog-walk, this was the reason she didn't like to go on. I had asked the judge if I could try again and after sometime she was not afraid anymore! Of course a disqualification, but the rest of the course was a nice-run, also the other 2 courses. For Joep his first agility-match into the Veteran-class. In October he became 7 years old, and because he's a big dog I had decided to let him start Veteran-class. He had run a clear Agility-Course. This was the last match before we will take part into the 10th PAWC in Nijmegen, so a good training. On the Jumping for Joep a clear run! The Summer of this year is very cold and with a lot of rain, also this match-day by KC Gooi- and Eemland. Joep was running a very good Game-course, which had given him a 7th place (of 69 competitors) and a little cup. 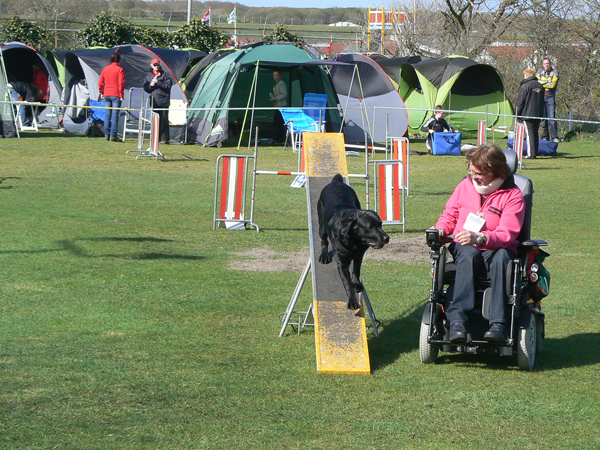 An agilitymatch of the Dutch Competition Agility with judge Martin Schoffelmeer. He had created courses with a lot of turns, so we need some extra time with the electric wheelchair! On the Jumping for Joep a very nice and clear run! 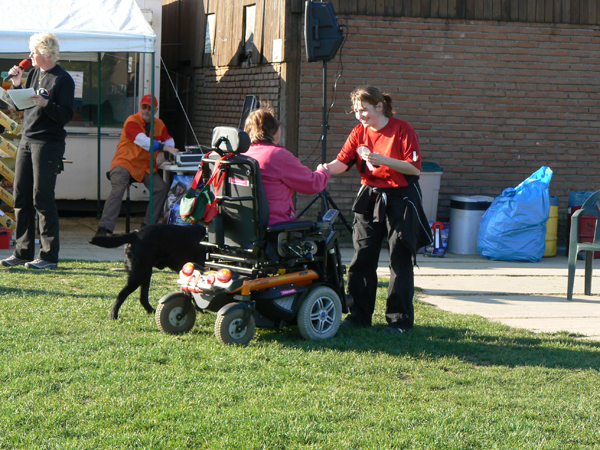 The 3th Selection-match for the Dutch team IMCA, being held from 1 untill 4 September in Nijmegen (the Netherlands). The tension was rising, because for a lot of competitors this selectionmatch was deciding (when they have good runs) for a place in the team! Judge was Peter Borsje, he will also judge on the IMCA & PAWC 2011. Our first agilitymatch of the Dutch Competiton of Cynophilia ( for valid handlers) with judge Adri van den Bosch. The rest of the day I haven't make any mistake anymore and ran nice courses. taking the contact on the see-saw very nice! On sundaymorning we start our journey to Bemmel to take part into our first agilitymatch outside. 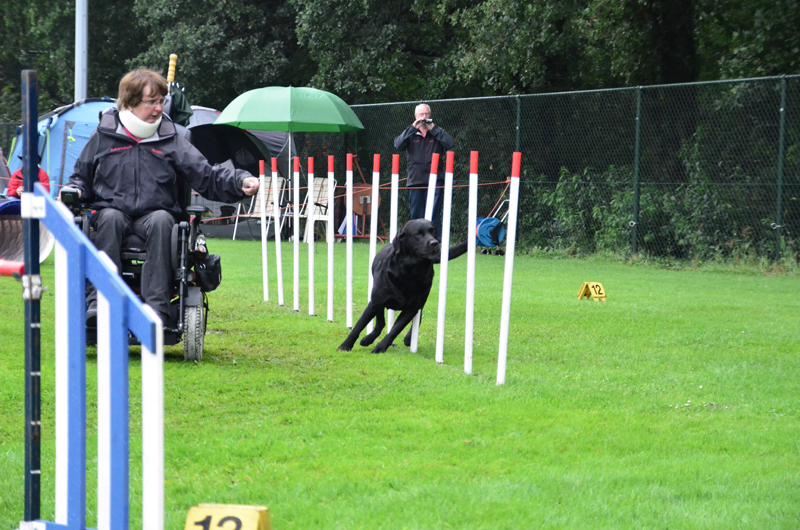 Mariëlle Bugel and Carl De Rouck of Dogshool Lingenwaard had organised an exhibition-agilitymatch for all classes. Early in the morning it was very cold, but later the sun was shining very nice, a good start of our agilitymatch-season. Joep was running good and on the second agility-course, with a clear round, he was winning a beatiful rosette for the second place. In the weekend 22 & 23 Januari was organised by "Agilityfriends" a open-classe agilitymatch individual and indoor on saterday and a Team-competiton on sunday. I had taken part on saterday with Joep and it was our first match after our winter-stop. Joep enjoyed very much and was running his three courses very well!